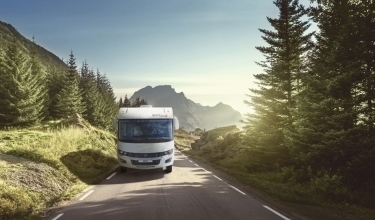 Distinction i1066 & i1090 are the result of over 55 years of experience and innovation focused on adventure. These two A-class models symbolise and epitomise French expertise and charm. 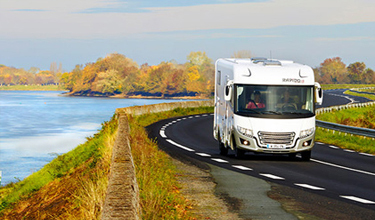 They form the crème de la crème of Rapido motorhomes in terms of both technology and comfort. 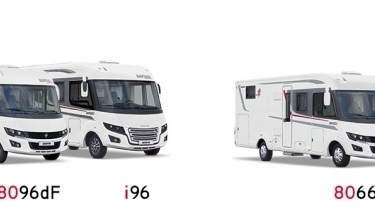 Distinction i1066 & i1090 are decidedly luxury models, setting new benchmarks for comfort, quality and design. The worthy heirs of the 10dFH series, these two models sit on a tag axle AL-KO chassis and are exclusively available in the heavy version. These two models are now part of the DISTINCTION range and therefore take on its codes. management. Starting with the XL storage double floor. Step inside to experience the 2.08m living room ceiling height which provides unrivalled space. 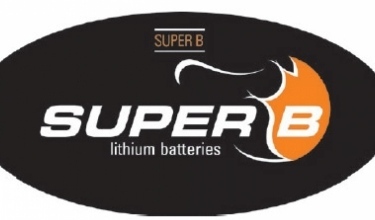 The external design of the Distinction i1066 & i1090 confirm their luxury quality. The fully moulded rear panel - specially designed for these two models – combines with carbon-inspired Premium décor and the streamlined grill to make these models unique. The aluminium side skirts add the final touch! 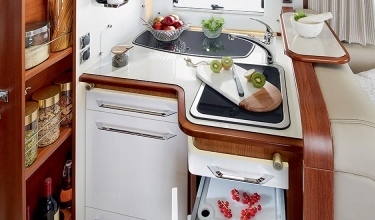 i1066 & i1090 feature a redesigned kitchen with a stylish worktop including one induction hob and new window cladding. The rectangular stainless steel sink now features a new chromed brass kitchen tap with ceramic cartridge and spray nozzle. The kitchen unit has been fitted with electric central locking drawers for greater user-friendliness. A coffee machine holder has also been included in this new kitchen design. At the flick of a switch, the holder elegantly floats down onto the kitchen worktop. Lastly, the 190L fridge/freezer and oven TEC-Tower rounds out the generous standard fittings. 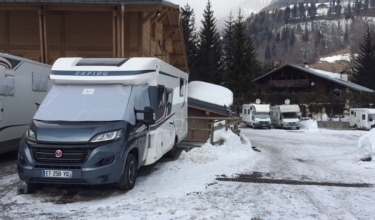 In the living room, a curved, heated cloakroom beautifully matches the luxury style of these vehicles. The side bench seat on the living area door side boasts brand new features. In fact, an electric TV unit is housed within the bench’s seat back. 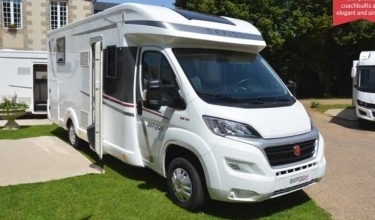 And for even greater comfort when parked, this bench seat’s depth can be adjusted..
With these two new Distinction models, Rapido blurs the line between your motorhome and house. 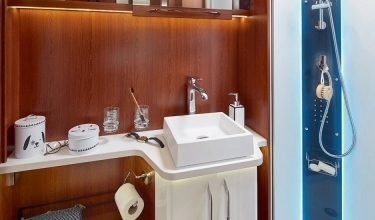 Discover a private, ultra comfortable bathroom where space and luxury are the watchwords. The bathroom basin countertop perfectly matches the kitchen worktop to create a faultless look. The basin itself is a brand new design. It is a thermoformed rectangular basin with a wall-mounted mixer tap. The shower cubicle is generously-sized and features double glass doors. Enjoy the comfort of your bedroom by choosing a twin bed or 160cm-wide XXL king siz e central bed layout. Regardless of which layout you choose, you can enjoy an electrically-adjustable reclining headboard. The permanent beds sit on aluminium base frames fitted with multi-directional springs. In the cab, RAPIDO decided to fit these two models with AGUTI cab seats as standard. 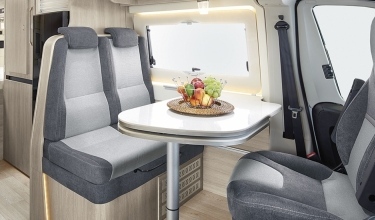 In addition to improved comfort, they also swivel and feature the same upholstery as in the living area. And so you can enjoy all this comfort without the need to compromise, the i1066 and i1090 are fitted with a lithium 90 Ah leisure battery as standard. Maximum onboard autonomy! 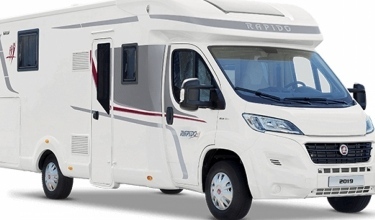 Rapido is famous for its unrivalled, inviting style. Particularly in the Distinction Series, where solid wood (Elegance) blends with the modern lines of the new furniture, glossy overhead cupboard doors and mounted racks. Create the right style for you by choosing from our nine upholstery options. The i1066 and i1090 both come with ALDE Arctic Comfort Plus central heating as standard of course. This includes over 30 convectors, equal to 30m of convector length. Two major heating innovations have also arrived. The towel rail in the shower is heated by convectors located in the adjoining partition. The heating system has been extended to the cab and the circuit flows under the cab seats. This supplements the cab heating system and effectively combats the cold. These two models proudly bear the Premium Edition logo. This means they boast exclusive features such as the EXECUTIVE PACK as standard! To view the full list of features, please refer to the technical manual.